Producing good academic writing is a difficult skill to master, and writing for an academic audience is different than writing for other audiences. As an academic writer, you must approach topics differently than you might as a journalist or creative author, and you must emphasize certain skills, such as writing clearly, and ignore other skills that you might have been taught in other contexts, such as using expressive imagery. To introduce you to this world of academic writing, in this chapter I suggest that you should focus on five hierarchical characteristics of good writing, or the “5 Cs” of good academic writing, which include Clarity, Cogency, Conventionality, Completeness, and Concision. I will now explain each of these in more depth and then discuss tensions between them in writing for different academic audiences. "Ambiguity is very interesting in writing; it's not very interesting in science." Many of us were taught in writing courses that ambiguity and obfuscation of meaning are laudable, because they make our writing seem more complex, deep, and witty. And many of our favorite novelists likely use ambiguity and other tricks to make their writing seem mysterious and complex. In academic writing, though, these practices simply suggest that you don’t know what you’re talking about. For academics, writing is a way of uncovering truths and realities of the social and physical world, so we should say what we mean. We should make it clear, and say it so that it is impossible for our audience to misunderstand. If your imagined reader ever has to squint her eyes and muse “I wonder what the author really meant by this,” then you have failed. If your imagined reader ever smiles to herself and chuckles at your brilliant wordplay, then you have failed. This is not to say that academic writing must be joyless and stodgy. It can be witty. It can be deep. But academic depth and wit come from the ideas portrayed through the words, not the words themselves. Too often, writers use ambiguity to hide sloppy thinking and beautiful language to hide destitute ideas. If you say something that could potentially be misunderstood, explain it. If a simpler word will do in place of a more complex one, then use the simple word. Don’t be afraid of laying out complex ideas across multiple sentences or paragraphs, but use the space available to you to open up your mind to your reader - what exactly you are thinking, how you are thinking about it, and why. If you use jargon, technical terms, or initialisms, then you should define or operationalize them. Defining a term means that you are relying upon someone else’s explanation of what the term means and are sticking with it (e.g., “Marwick defines ‘social media’ as…”). Operationalizing a term means that you are using a term that might mean multiple things but you are deciding to only use it in a very finite and specific manner (e.g., “In this paper, I use the word ‘engagement’ to mean…”). In the case of initialisms, no reader should be expected to know what a PBL, SNS, LMS, CMS, or PBIS is by virtue of the letters themselves, and often even technical initialisms might have multiple meanings (e.g., PBL in education might refer to “project-based learning” or “problem-based learning”). So, when you use initialisms in your writing, define them at the outset (e.g., “positive behavioral interventions and supports (PBIS)”). If you find yourself repeating the same words over and over again, that’s okay; don’t use variety in your language just for the sake of variety, because in highly technical academic fields every word carries with it technical baggage that you may not intend. If I’m talking about a “curriculum,” then I shouldn’t swap this out with “program,” “module,” “subject,” or “materials” just because I’m tired of saying “curriculum;” each of these words means something very different, and using these terms interchangeably just shows my reader that I don’t understand the differences between them. In short, other types of writing often rely upon ambiguity and obfuscation to prevent their underlying thought processes from being examined, but examination of these processes is the whole purpose of academic writing. We are not poets, politicians, or preachers, whose primary goals are to be convincing or mystical; rather, we are fellow learners that can only learn together insofar as we can clearly reason together through a dialogic process of clear writing. Conclusion - Therefore, test creators should seek to understand why such tests are biased toward some students and should seek to remedy this issue. Once a conclusion is drawn, it can then be used as an assumption for a subsequent argument. This means that the overarching argument for a paper actually consists of many micro-arguments made throughout the paper that build upon one another like bricks in a wall. Essentially, each paragraph in an academic paper should be treated as its own separate argument, and these arguments then build off of each other to construct the overarching argument. To help reveal your logical structure, each paragraph should generally represent its own argument. It should start with a topic sentence, provide evidence, and then draw a conclusion that you then build upon in the next paragraph. This is what people often refer to as logical flow: moving from one idea to another without any unsubstantiated gaps. Since you must substantiate each claim that you make in an academic paper, you should also be careful not to overstate claims (e.g., using superlative language) and not to make claims that you cannot provide evidence for. Oftentimes, this is done by toning down language (e.g., “project-based learning can be an effective pedagogical strategy” [toned down] vs. “project-based learning is the best pedagogical strategy” [superlative]) and using helping verbs, such as may, can, and might (e.g., “social media use may contribute to student depression” vs. “social media make kids depressed”). By toning down your language, you introduce possibilities for doubt (which academics should always be open to) and also prevent your argument from being invalidated by a single counter-instance (e.g., “my kid uses social media and is not depressed, therefore your argument is invalid”). "Writing [without structure] is like playing tennis with the net down." In order to understand each other and to know what to expect when we are reading a new manuscript, we need some conventions to provide uniformity. If every article you read had a unique structure, formatting, spacing, capitalization, font size, style, tone, and so forth, you would have increased difficulty comparing it to other work that had gone before. However, if every time you approach a new piece of writing you know what to expect and where to find it, you will be able to more efficiently recognize where to go and what to look for in the paper. Rather than hunting for the research question, you will know that it will be found right before the methods section and that results will be provided right after that section. Similarly, when you see a bolded and centered line of text, you will know that this means that a new top-level (H1) section is beginning and are not left to wonder why the author made such a bold stylistic choice. For these reasons, groups of academics have sets of guidelines that they agree to follow, and in our field we follow the American Psychological Association’s (APA) Handbook (version 6). That handbook covers everything from structure and formatting to style and tone, and theses, dissertations, and class projects require students to follow these same guidelines to help ensure that student work is written in a way that will allow it to be published to a wider audience. To assist you in following APA guidelines, you can access this Google Document [https://edtechbooks.org/-EBR] that has proper APA heading formats built into it. 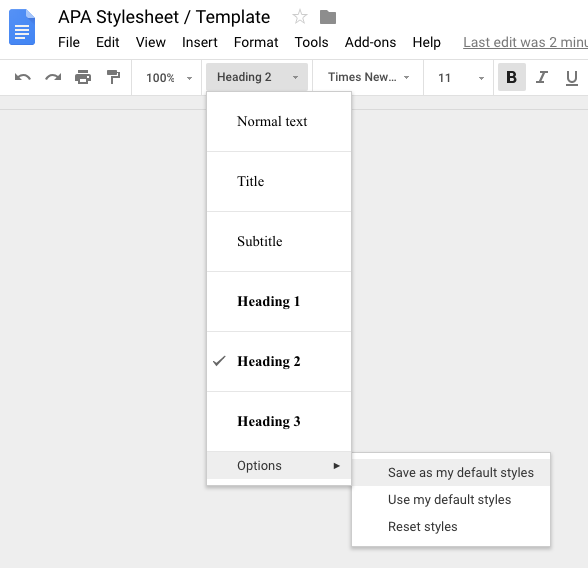 Then, click on the Styles dropdown > Options and save the APA styles as your default styles, thereby making any new documents that you create in Google Drive follow the APA conventions. "Our duty is to believe that for which we have sufficient evidence, and to suspend our judgment when we have not." Since the goal of academic work is to inform as broad an audience as possible and to stand up under the scrutiny of diverse sets of eyes, you must flesh out your writing to address all of the major questions and doubts that your readers might have. Thus, you must not only make an argument that might be convincing to a few people, but you must include sufficient detail and explanation to allow your writing to hold under the scrutiny of the most critical reader. That is, you must write for your greatest critic, not your greatest fan. This is why academic publishing relies upon peer review. The assumption of peer review is that the best way to ensure quality of writing is to put an author’s work in the hands of dispassionate, unbiased, and diverse experts who typically do not know the identity of the author. This allows reviewers to be honest in their feedback and prevents them from relying upon their personal relationships with or knowledge of the author to fill any gaps (e.g., “I’ve heard of Dr. Avila, and she’s done great work before, so I’m assuming that she did good work here, too”). Rather, every piece of academic writing must stand or fall on its own merits and not on the author’s prior quality of work or reputation. To do this, you must be explicit and detailed, assume that your reader does not know or trust you as the author, and treat every piece of academic writing as a completely self-contained, self-sustaining, self-validating artifact. Most journals in education and other social sciences have strict article word limits of 4,000 to 7,000 words, or roughly 20 to 30 double-spaced pages. This historically has been done to accommodate publishing limitations, because printing pages in a journal is expensive, but even in a digital world, with practically zero publishing costs for adding additional words, imposing limits helps to reduce information overload on readers and to drive more readers to your work. After all, a moderately-interested reader is much more likely to read a ten-page synopsis of your dissertation than the 200-page document itself, and only the most devoted of readers will stick with it after 20 pages or so. This means that you as the author must not only meet all of the requirements established by the previous guidelines, but you must do it on a strict word budget that avoids unnecessary detail or repetition. As you’ve probably guessed by this point, the demands of each of these guidelines sometimes conflict with one another. For instance, being complete might mean that you are not very concise, and being clear might reveal the irrationality or poor cogency of your argument. At such times, you must prioritize the guidelines to determine which to emphasize and which to ignore. Depending on the type of academic writing you are doing, the way that you prioritize guidelines may vary. For instance, a journal article will normally value concision over completeness, due to publishing word limits and trying to make the article as accessible as possible to a wide audience, while a systematic literature review for a thesis or dissertation will do the opposite, requiring students to reveal all of their understanding of their topic and how it is situated within the broader field so that their committees can be assured that they actually know what they are talking about. Similarly, a quantitative empirical paper will rely heavily upon the conventions established by the paradigm (e.g., p-values, effect sizes), while a qualitative empirical paper will need to provide completeness in its descriptions to allow for trustworthiness and at times ignore conventions. Theoretical papers will also often necessarily defy some conventions in favor of laying out a clear and cogent argument, because the proposed ideas will be new and will not neatly fit within existing reporting approaches but will nonetheless need to be argued in a reasonable and compelling manner. All this is to say that though these guidelines are all important, their relative importance to one another varies by the context of the writing as determined by purpose, audience, and methods. When asking these questions, something always has to give, such as cutting that explanatory paragraph to get an article under the journal’s required word limit or adding an additional paragraph to make it clear to your thesis readers that you understand the implications of what you’re saying. Through it all, however, each of these guidelines is generally important to follow, and you can only justify ignoring one temporarily in those cases where tensions exist and your intended audience requires you to prioritize another guideline in its place.